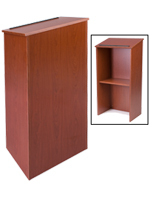 These mahogany open back podiums are great for schools, offices, churches and other venues with their large angled desktop. 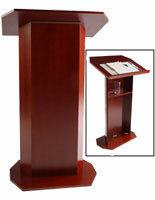 Each floor standing pulpit comes with (4) adjustable levelers for accommodating any type of flooring. 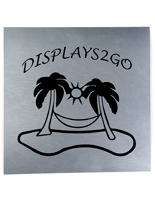 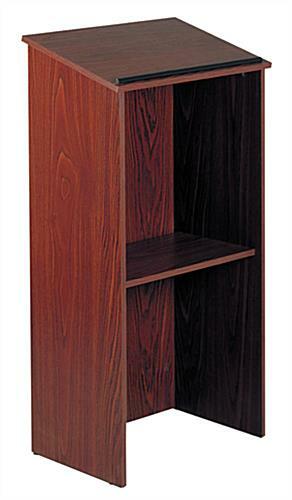 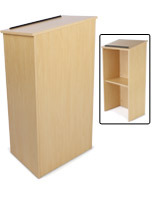 The open back podiums are made of laminated MDF that resists stains, water and scratches. 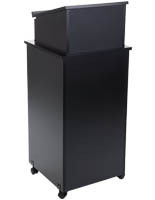 The lectern's desktop has an angle of 15° features a 1" book stop that prevents reading materials from falling off. 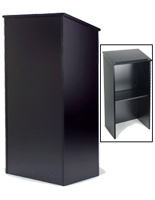 The floor standing podiums with adjustable levers ship unassembled to reduce shipping costs, but can be easily set up. 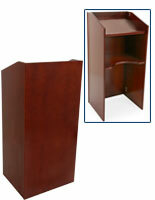 The office pulpits are also available in black, cherry and maple finishes. 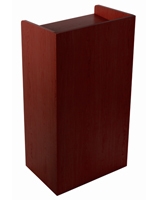 23.0" x 46.5" x 16.0"